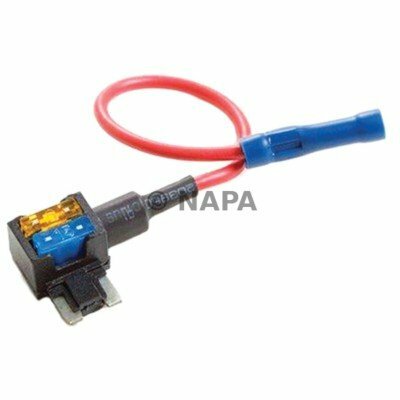 Tapping Switch Power (2018 - SV650X)? I installed an INNOVV K2 camera system (Dashcam), and used the fuse for the lo-beam for the yellow wire that switches the system on and off with the ket. The only issue is that that won't work if I then switch to hi-beam, because the unit will shutdown, there doesn't appear to be a fuse for the taillight (just so everyone knows - Lights are always on for this bike 2018), but even then I am not sure that would have worked either, because it may switch to a different bulb when hitting the brake. I guess I am not sure what I can tap into, that will switch the unit on and not switch it back off until I turn the key off? Here is a picture of the fuse box cover, not much to choose from. Might need someone with electrical experience and tools to hard-wire something off of a wire in the wiring harness, but REALLY don't want to cut into the existing wiring harness if I don't have to. Thx! My understanding is that the Innovv has a built in 10 second timer, so when you start the bike, it will not turn on the cameras for 10 secs. If so, tap direct off the battery for power, with a fuse, and use ignition for the feed to the yellow wire. This should not do anything untoward. Your description above seems that the low beam does not stay on when you select Hi beam, so no feed, shuts down the cameras. I would use the IGNITION line, that should be hot when the key is on. You also should include an inline fuse, say 5A, to protect your new wiring and the camera. The yellow wire comes off a power converter (12v-5v), that has a fuse built into the power (red) line from the battery, so I'm OK there. I tried using the ignition fuse for the yellow line, but that didn't seem to do anything, I'll try it again though (i was testing with the ignition ON, but not running). I assume the yellow line needs to stay hot, or it will shutoff the camera, at least that seems to be the case when I tested it. I know that activating the hi-beam will shut the unit off though if the yellow line is connected to the lo-beam. You should be able to find a wiring diagram for your bike and then you should find appropriate connectors. My bike (KTM from 2017) has AUX power connectors and I can chose between always on and after ignition. It has also a built-in but optional alarm system with a fuse which can be used for anything else. Maybe your bike has similar options. I was able to get the ignition fuse to work, not sure what happen last time, so its now working. But like you, I would rather wire this in correctly, I see what I think is a free acc wire connector, but not really sure, and I would need to find a female connector side somewhere in order to wire it in, if I did choose that path. But I'm really not even sure about that acc wire, why are there no fuses available for anything other than whats shown in my picture above? So I might not have many options. I almost purchased and installed the optional factory PIAA foglights, but when I looked at the installation instructions, all they do from the factory is use one of those pinch style wire taps to piggyback I believe off the lo-beam headlight wire. So there may not be any accessory wires available.....until I get someone with more knowledge than me (and I am not the person to be playing with wiring harnesses.....LOL) too look at this, I think I'll stick with the fuse. I think something like this might work plugged into the ignition fuse holder? Not sure why there are two fuses though. Yeah, they say the top fuse is for the line out, but the cover on my fuse box won't work with this, so probably a no-go unless I want to carve up the fuse box cover to make it work. If I read the specs correctly the 12/5 converter has a 2a fuse on the input and a 2a fuse on the output. I would connect the yellow wire to the taillight feed. I assume the tailight is on when the bikes ignition is on or when the bike is running? If your converter doesn't have the 2A fuse holder in the red wire just buy one of those. The converter is powered 100% of the time by the battery but only powers the camera when power is applied to the yellow wire. My suggestion the rear light feed. There is negligible power consumption by the switching circuit so it doesn't need a fuse. The red wire from the battery is switched only by the unit itself. If I read the specs correctly the 12/5 adapter has a 2a fuse on the input and a 2a fuse on the output. I would connect the yellow wire to the taillight feed. I assume the tailight is on when the bikes ignition is om or when the bike is running? There is no fuse for the taillight, but the taillight is on all the time, and not sure if there would be a problem when the brakes are applied....is their an increase in voltage, a second bulb, etc? But I still don't want to cut into the wiring harness to do this, thats what I am most interested in avoiding. The ignition fuse works perfectly right now, and it doesn't reboot the dashcam when I go from "ON" to starting the motorcycle either, so that seems to be my best bet. I should just buy this fuse adapter, then carve the fuse box cover to work, there is some fuse storage slots built into the fuse box cover, I could just remove those with my dremel to make room for this adapter. It will be tight even when carving some room, so not really sure I can make it work. The adapter is cheap though, so might just buy it to take a look at it. You don't need a fuse in the yellow wire only the red one from the battery. The converter does the switching. Those cut right thru the insulation, again, I don't want to compromise the wiring harness....so these I am avoiding at all costs. I'm only using the ignition fuse because its convenient, and I don't have to cut into any wires in the wiring harness.